Mountaineering Scotland supports the 'Keep it Wild' campaign which highlights potential tourism risk from industrial development of Scotland�s scenic areas. As tourists flock to Scotland�s scenic outdoors for the summer holidays, a clear majority would be put off visits by industrial development. New research released the John Muir Trust has highlighted the potential benefits for Scotland�s tourism industry of protecting the country�s unique Wild Land Areas from industrial-scale development. A survey carried out by YouGov on behalf of the conservation charity reveals that the majority of Scottish adults � 55 per cent � are �less likely� to visit scenic areas in Scotland if they contain large scale infrastructure, like commercial wind farms, electricity transmission and super-quarries. Just three per cent said they were �more likely� to visit such areas, while 26 per cent said that the existence of large scale developments would make �no difference� to their decision to still go to scenic areas anyway. Of the remainder, 10 per cent were undecided, while six per cent expressed no interest in visiting scenic areas at all. The figures were released to mark the latest stage in the John Muir Trust �Keep it Wild� campaign, which calls on the Scottish Government to use the forthcoming Planning Bill to give Wild Land Areas protection from damaging industrial-scale development, similar to the protection already in place for windfarms in National Parks and National Scenic Areas (NSAs). 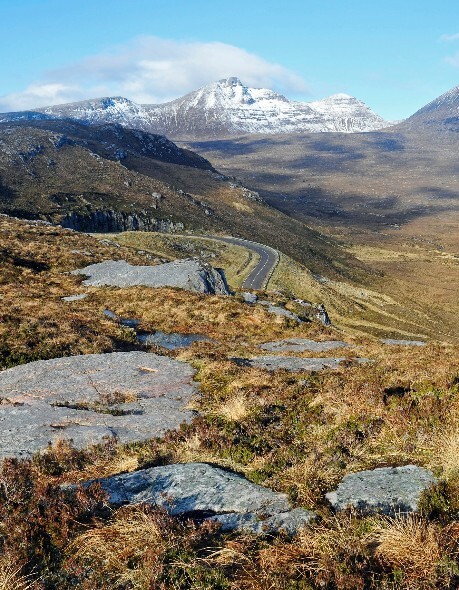 Further YouGov survey results released at the start of the campaign in June showed that 80 per cent backed the proposition that Scotland�s Wild Land Areas should receive continued protection from large-scale infrastructure development. �As schools across England break up to the summer holidays this week and many families flock to Scotland for breaks, we must stop and ask what they value about their stay. For many, it�s the ability to enjoy being outdoors in Scotland�s unique, unspoilt natural landscapes . �Visitor expenditure in Scotland�s National Parks alone is worth �187 million a year, with further revenues brought in by tourism businesses in scenic areas from Shetland to the Borders. So when a clear majority of people say they�d be put off visiting scenic sites like Wild Land Areas by the existence of large-scale wind farms, giant pylons, super quarries and other inappropriate commercial developments, policymakers have to pay attention, before it�s too late. A similar YouGov poll run in 2013 found 51 per cent of respondents were �less likely� to visit a scenic area which contains large scale developments, compared with 55 per cent today. 28 per cent said they would definitely visit such areas anyway, compared to 26 per cent in the latest poll. The latest findings suggest that Scottish tourists to scenic areas are becoming increasingly concerned about the effect of overdevelopment on scenic areas. �The North Coast 500 has become one of the world�s top touring routes in the last two years based on a wild land and seascape that has existed forever and we are now exposing the world to this amazing place that is the North Highlands. The Keep It Wild campaign urges people to show their support for Scotland�s Wild Land Areas to be protected as a unique natural legacy for future generations by writing to their MSP and / or Scotland�s Planning Minister, and getting involved on social media using the hashtag #keepitwild. All figures, unless otherwise stated, are from YouGov Plc. The total sample size latest research was 1,028 Scottish adults. Fieldwork was undertaken between 18th and 22nd May 2017. For the 2013 survey, total sample size was 1,119 Scottish adults. Fieldwork was undertaken between 18th - 20th June 2013. Both surveys were carried out online and have been weighted and are representative of all Scottish adults aged 18+. In June 2014 Scottish Natural Heritage � the Scottish Government�s official agency that oversees nature and landscape � published a map of 42 Wild Land Areas covering just under 20 per cent of Scotland�s total land mass. These areas are characterised by perceived naturalness, ruggedness and absence of major human infrastructure. The Scottish Government promised significant protection in planning policy for Wild Land Areas at the time they were officially recognised in 2014. However energy developers continue to submit applications to construct industrial-scale wind farms in these areas, and, although a number have been refused permission, the recent decision to approve the Creag Riabhach wind farm in Altnaharra has created uncertainty about the continued protection of Wild Land Areas into the future. This is the first time consent has been given for a wind farm within a Wild Land Area. There are a number of other major wind farms proposed, in various stages of planning approval, which would also have a major impact on Wild Land Areas. These include Caplich (20 turbines) in the shadow of Ben Mor Assynt; Strathy South (39 turbines) in the Flow Country and Limekiln (24 turbines) near Reay in Caithness. Mountaineering Scotland has opposed all the above wind farms. The latest VisitScotland figures highlight the importance of scenic areas to Scotland�s tourism sector. Undertaking activities in Scotland�s outdoor attractions accounted for 19 per cent of total day visits in Scotland in 2015. Over 800,000 trips were made by GB residents to Scotland�s National Parks, accounting for 7 per cent of all GB overnight trips in Scotland and visitor expenditure totalling �187 million.